The deliciously uplifting new novel from the Sunday Times bestselling author of MEET ME AT BEACHCOMBER BAY. Not to be missed by readers of Lucy Diamond and Katie Fforde. When Mimi first visits her dad's new home in the Cotswolds, she quickly falls in love with Goosebrook and its inhabitants. (Well, maybe not rude Henrietta, who lets Mimi walk miles in the rain rather than give her a lift.) There's Paddy, with his flashing eyes and seductive charm. Friendly and funny Lois makes her laugh. And seriously gorgeous Cal is welcoming and charismatic. Mimi would be more than happy to return to Goosebrook if it means bumping into him again...Time passes and Mimi comes and goes, and concentrates on her career. Yet as their lives continue to intersect over the years and emotions (or relationships) become tangled, it's Cal who makes her feel most welcome whenever she does return to Goosebrook. But if he's The One, will it ever be the right time for them both? 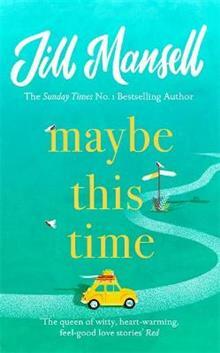 Maybe This Time is the thirtieth fabulous, feel-good novel from Jill Mansell, whose books have sold over 11 million copies around the world. Her hobbies include buying stationery, particularly magical new colours of ink for the fountain pen she uses to write all her books. (And if 'magical' sounds far-fetched, go on, just take a look at internet images for Emerald of Chivor, Jill's favourite.) Jill lives with her family in Bristol.